ItemC-00465 - Division 2, South Park School, Victoria. ItemC-01174 - Pemberton; John Miller's stopping place. ItemC-01178 - "At the rock, Cottonwood Canyon"; the sternwheeler Charlotte navigating Cottonwood Canyon on the Fraser River. ItemC-01179 - "Where line is picked up, Cottonwood Canyon"; the sternwheeler Charlotte navigating Cottonwood Canyon on the Fraser River. ItemC-01184 - Mail stage entering Quesnel. 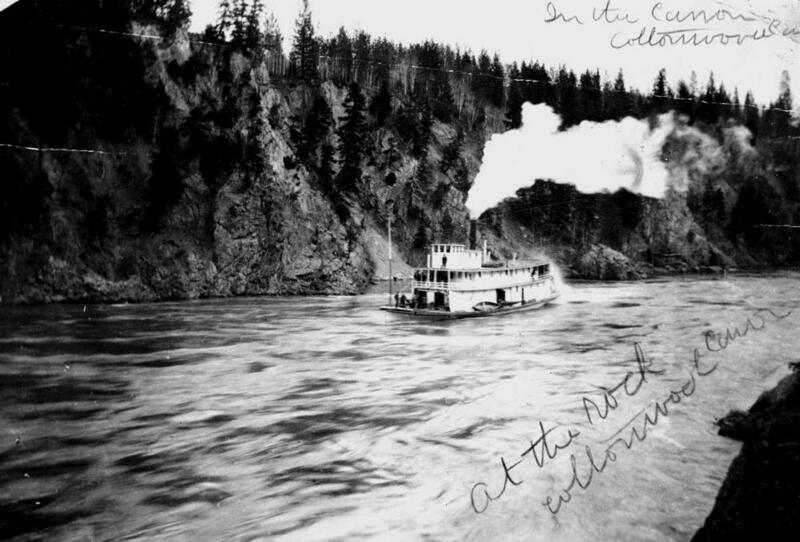 Item C-01178 - "At the rock, Cottonwood Canyon"; the sternwheeler Charlotte navigating Cottonwood Canyon on the Fraser River.